Houston, TX, August 3, 2016– There's a new plan...Instead of Dropping the Entire "Single SHOTS " EP... Starting Today, August 3rd, 2016 and EVERY 3rd of the Month until December 3rd, 2016... Lady Hennyssi will Drop a "Single" off the EP. 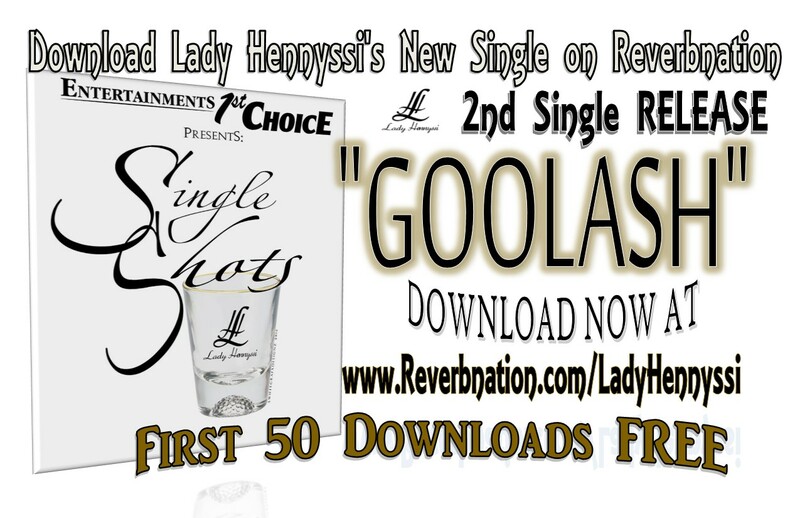 With each Release She is Giving Away 50 Downloads for FREE on the Official Lady Hennyssi Website ladyhennyssi.webs.com . After 50 Downloads the Single Song will not be available again for keeps until Late December 2016. January 2017, Lady Hennyssi fans can look forward to A Full 11 Track LP/Album titled "Intoxicating". This Album will have MORE UnDiscovered Producers and World Class Collaborations from Artists across the Globe. ..A MUST HAVE...but You know that already! !! So, make sure You Set Your Calendars for the 3rd of each Month until December 2016 so that YOU can be amongst the 1st 50 Exclusive VIPs to DOWNLOAD Each Single Shot before anyone else. ...So basically, that’s 50 People Across the Globe that will have the ENTIRE EP before the masses. First Up is "GOOLASH"... The 2nd Single off of the Upcoming EP " Single SHOTS ". Produced by West Coast Legend Richard " The Real Richie Rich" Anthony of Rich World Productions (LA, CA). Written by Ishia "Lady Hennyssi " Alexander II. "GOOLASH" was Recorded, Mixed and Mastered at Sunrise Studios in Houston, TX by the Infamous Mr. DJ to the UnDiscovered himself, Anthony" DJ DreamKast" Alexander II. "THIS ONE is on ME....Next Release, 3rd Single September 3rd, 2016.!" ~L.H.